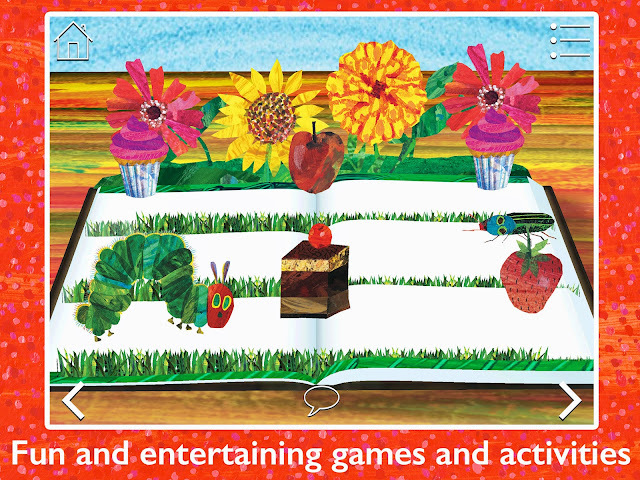 This month we are spotlighting books by Eric Carle as part of our Virtual Book Club for Kids! Our absolute favorite Eric Carle book is The Very Hungry Caterpillar. In fact, we have over 25 hungry caterpillar crafts and activities that we have collected and tried! 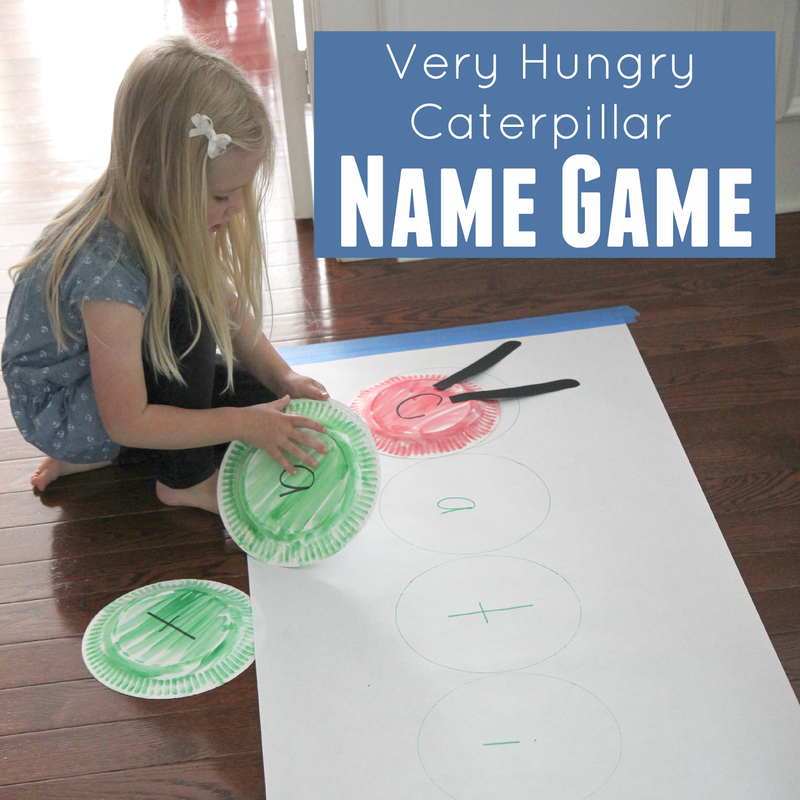 Today we are going to share one simple Very Hungry Caterpillar inspired activity with you PLUS we have a really fun Very Hungry Caterpillar giveaway at the end of this post. Make sure to scroll down. My kids love name activities and crafts, so we do them a lot. Use the paint markets to color the back of one paper plate red and to color the backs of the rest of the paper plates green. Next add cut out two black pieces of paper to be antennae and tape them onto the red paper plate. Write the letters of your child's name on the paper plates. Make sure you only put one letter per paper plate. Next, roll out a piece of paper and secure it to the floor or a table using painter's tape (you can tape all the way around it to keep it super secure and avoid any ripping). 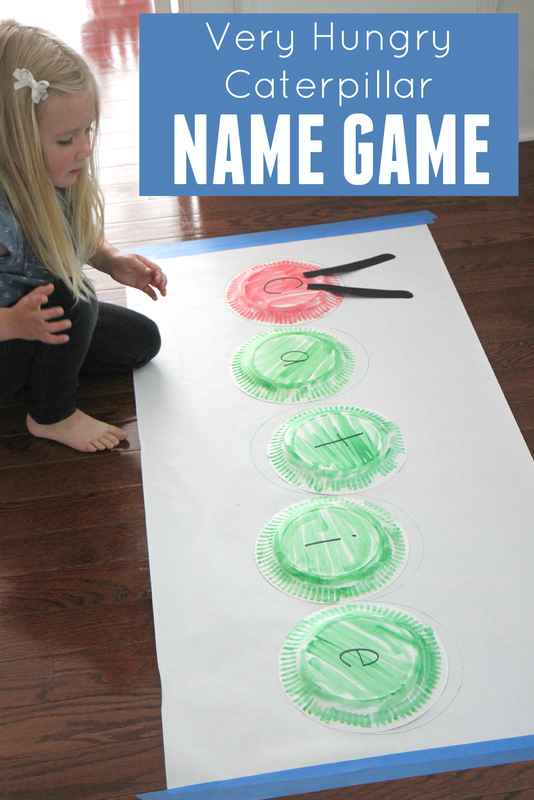 Trace a paper plate with a marker and make enough circles for all of the letters in your child's name. Write the letters of your child's name inside the circles, in order. Now you are ready to play the Very Hungry Caterpillar Name Game! Here's a quick video sneak peek! You can scroll down for more instructions. Have one player hide the paper plates around a room while the other player covers her eyes. Lastly, match the colorful Very Hungry caterpillar plates to the circles on the paper. While we played we practiced saying the letter names, identifying which letter was first in my daughter's name and which one was last... and talking about some of the sounds that those letters make. We also talked about the colors of the plates and had fun moving around while we hide the plates and found them! It is easy to get siblings involved in this activity because they can help hide plates or encourage littler siblings as they seek and match the plates. This is just one of several simple Very Hungry Caterpillar activities that we will be sharing with you this week! Make sure to stop by tomorrow to see what other fun ideas we enjoyed at our Very Hungry Caterpillar preschool co-op last week. Today we are excited to be partnering with Story Toys Entertainment to share a little bit about the new Very Hungry Caterpillar & Friends apps! 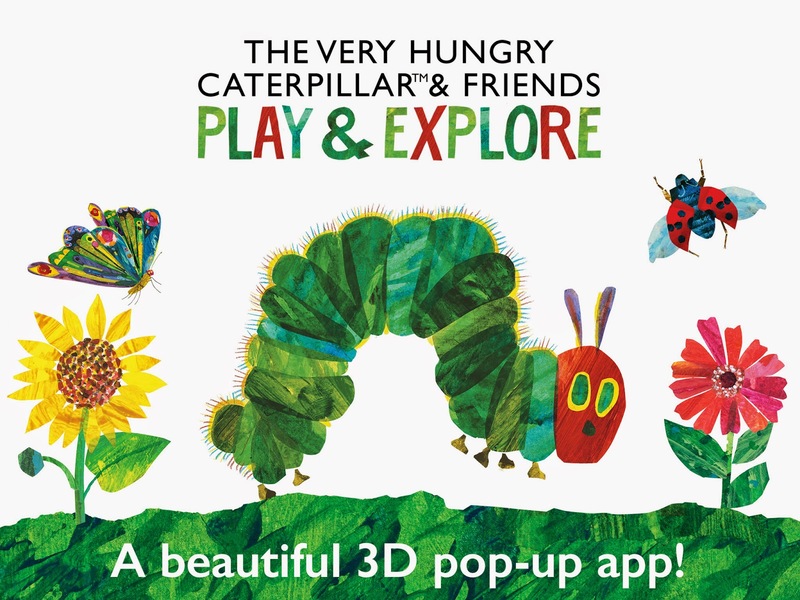 We tried out the The Very Hungry Caterpillar & Friends - Play & Explore app recently and really enjoyed playing around with it and checking out the gorgeous images. The free version shows samples of the different activities and the paid version gives you access to a complete storybook along with several other additional things you can add, like puzzles games, and a stickerbook. Below you'll find photos of some of the activities included in The Very Hungry Caterpillar & Friends - Play & Explore App, although I was mostly just mesmerized by the animations and illustrations and spent my time admiring them. We liked trying to help the Very Hungry Caterpillar navigate around all of the sweet treats and eat the healthy food in the game that we played. We also liked putting together puzzles and working to spot the differences in little pictures. The quick animal facts were enjoyed by my kids and they also thought it was neat to listen to different animal descriptions and try and figure out what the narrator wanted them to point to. The FREE version of the The Very Hungry Caterpillar & Friends - Play & Explore App contains a few puzzles, a few spot the difference games, and a sticker game so that you can make your own pop up book. 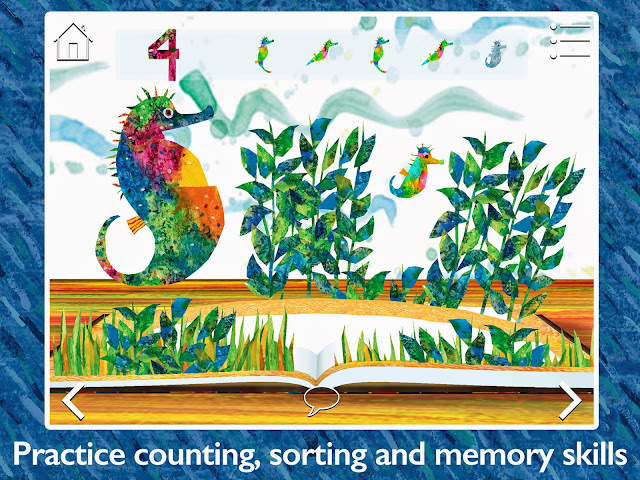 The 3D pop-up book shared in the app is based on a variety of Eric Carle's characters including Mister Seahorse, The Very Quiet Cricket, Brown Bear, The Mixed Up Chameleon and 10 Rubber Ducks. 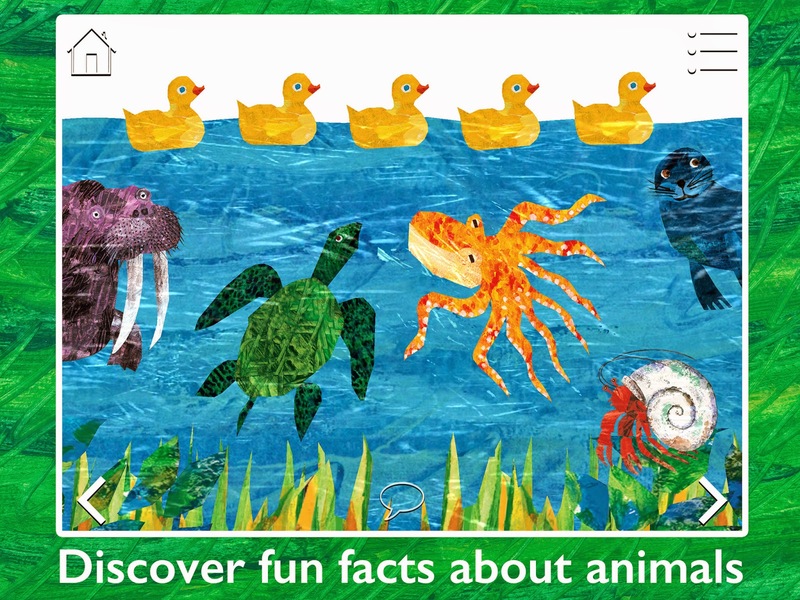 The app has fun educational games and activities as well as pages of text with fun facts to teach children about nature. You can also pay to unlock additional games and activities for your kids. I am excited that Story Toys is offering THREE Toddler Approved readers a copy of the app to explore and enjoy. You can enter the giveaway in the rafflecopter below. Please note: The app code being given away can only be used on iOS devices. Make sure to fill in the rafflecopter giveaway entry below and complete the mandatory question entry. The winning entry will be drawn on Thursday, May 21st. I will notify the winner via email. Disclosure: Story Toys provided us with a free copy of the app to try out and share with you and we were compensated for the time it tooks for us to explore and play with the app. All opinions are mine. We have been working on 3 year-old's name so this will be perfect! Plan to do it today! What a fun way to learn your name. I love the paper plates idea as so much quicker than trying to cut out circles. my son LOVES the "my first book of shapes!"